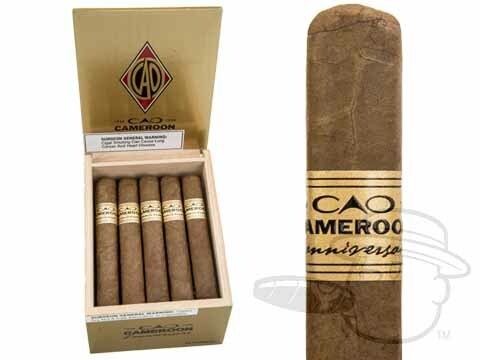 The CAO L’Anniversaire Cameroon was blended to commemorate the ever-innovative company’s 30th anniversary. These buttery stogies feature a toothy African Cameroon wrapper leaf, along with earthy Nicaraguan binder and fillers. As well-constructed as it is delicious, the CAO L’Anniversaire Cameroon boasts notes of butter, toast, caramel, rich baking spice, and black pepper and remains easygoing and maintenance-free from the moment you toast the foot to the moment you set down the nub. One of the best smokes available. Best Cigar Prices provides an easy and affordable way to order and enjoy this product. One of the best cigar sites on the web. My top 3 CAO “goto” cigar. Prelight sweet nuttiness for sure. Cocoa, coffee bean, tangy cedar. Medium to full body. Firm construction. CAO L'Anniversaire Cameroon Robusto is rated 4.6 out of 5 based on 7 customer ratings.